She lies squinting in the afternoon sun. Looking up at the blazing ball of fire, she defies the curly strand resolutely falling her way. She wonders if hell was right in the middle of the sun. Would she go? Go to hell, that is. Umm.. she has her chances. Spilling milk, tearing pages off a school book or rather any book and stuffing ones mouth with heapfull of sugar does make one go straight to hell. For sure, thought she. But then like how it is with most six-year olds, her thoughts jump from dreary to the quixotic in no time, wondering if the sun is made of honey or lime or both. The dreamy spell is broken by shrill cries of mother. Lengths of the roof covered in leaps and bounds, spirals of stairs run in twos and threes, the little girl runs blind, her curls flying behind her like a short cape. Huffs and pants, she stands erect and stares straight. A little sentinel to attention. Mother hid a smile. She knew she was being appeased. Propitiated for those tight hugs and extra kisses, and for those moments when the curls would be delicately touched and taken behind a ear only to fall right back into an eye. For those special moments mother was being assuaged. Mother knew it. And she knew she knew it. Well today no matter what, lunch will be eaten in peace sans objections, sans tantrums and grimaces, clever mother put out a plate which would have been shunned on any other day. But not today. Not after a morning of mess and shenanigans. And the little sentinel ate silently. The one with the largest sweet tooth, the stuffer of anything saccharine, sugar stealer, ingenious chocolate hider. That one, battled her candied tongue and slurped spicy tangy tomato rasam that day. Quietly. Obediently. Fully unaware that her runny nose needed all that pepper and spice. I know now for sure, coz she is me. Cut to present day. And I war with my seven-year old to stop slurping the tangy South Indian soup. It has pepper and garlic and red chiles and its hot and medicinal. I mean, she is supposed to dislike it. All kids do. But here is mine. Sprawled on the floor, demanding more ghee and more rasam in her bowl of soft white rice. It’s close to eight years now, and I still stare at my girl in disbelief. She is so unlike me. Gone on the father, I mutter. Both have an unbelievable palette for spicy tangy tart stuff. Saccharine love has diminished over the years, and rasam which was once gulped like venin, is now savoured with abundant paraphernalia. 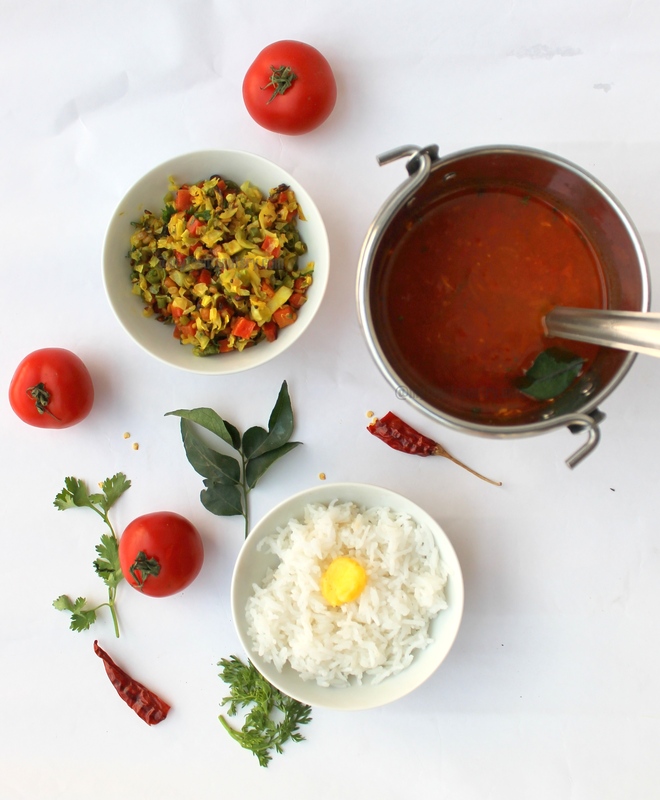 Lentils, lemon, beets are used to make a variety of rasam. 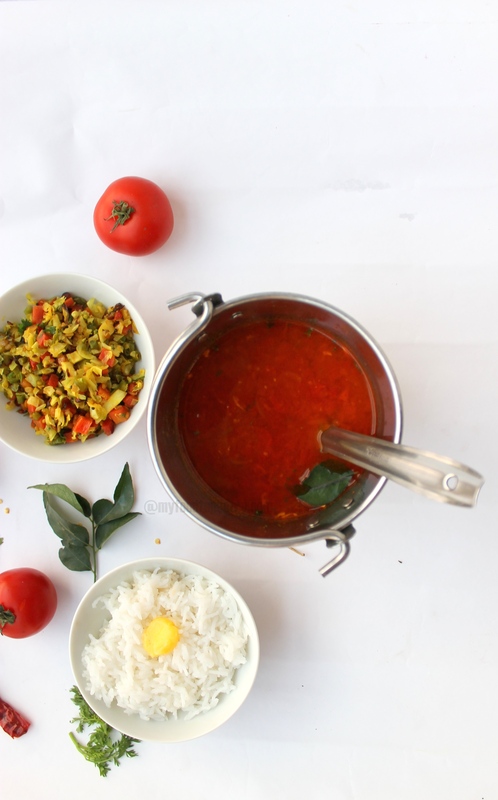 But the most common and easiest and popular one is the tomato rasam. The method I use is handed over to me by my brother in laws wife, and it has never been easier to make it since. One of my most favourite ways lately. that very essential dollop of ghee! 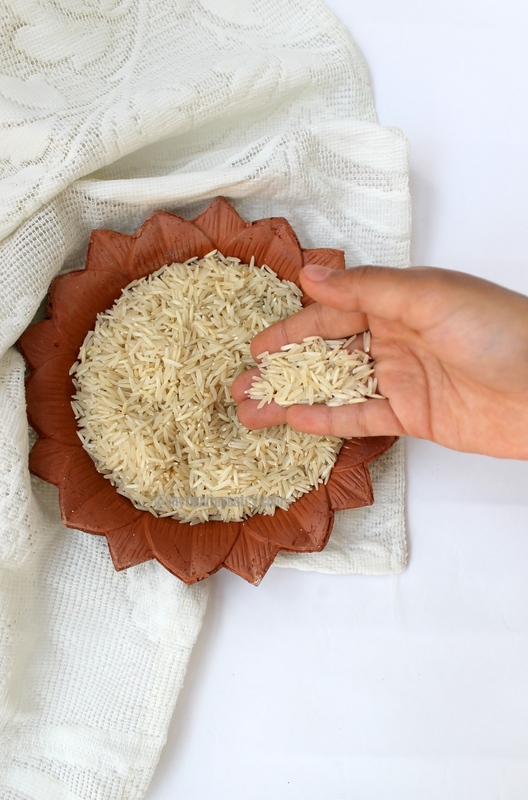 Make sure you have a potful of hot boiled rice, white or brown. Some ghee to serve. And I usually accompany the meal with some vegetable side like the one shown below. A cabbage carrot beans melange. Dry sauté with a tempering of curry leaves, green chilies and garnished with grated coconut and cilantro. I have no idea about the science behind this, but I am making this statement – Food, especially, Indian Food tastes better when you eat with your hands. Its more intimate, more comforting. I can’t explain. It just is. So try it. Learning to use chopsticks was hard?! 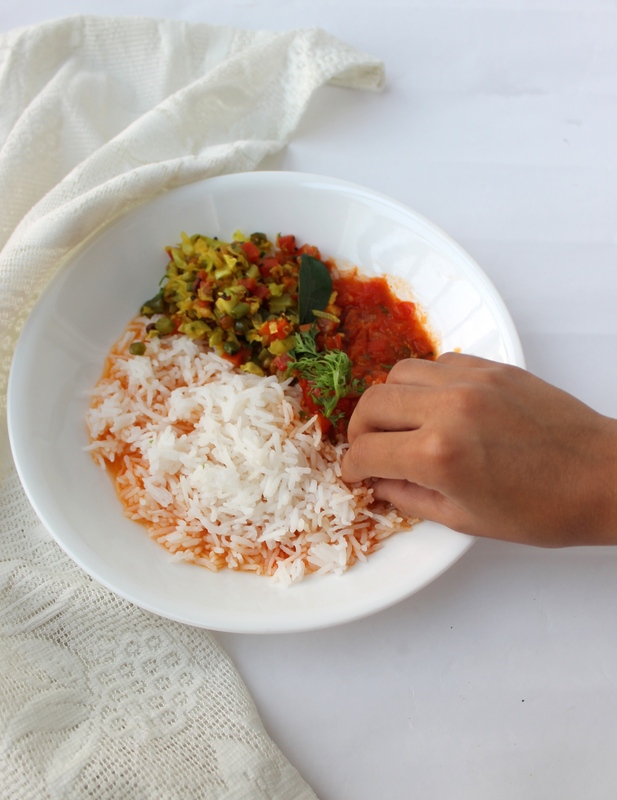 try scooping off watery rasam from a flat plate with your fingers. That’s art too. 5-6 red ripe tomatoes, washed and chopped. 3-4 cloves of garlic, grated – optional. In a thick bottomed pan, heat ghee. Splutter mustard seeds. sauté red chili, curry leaves and sliced onions till pink. 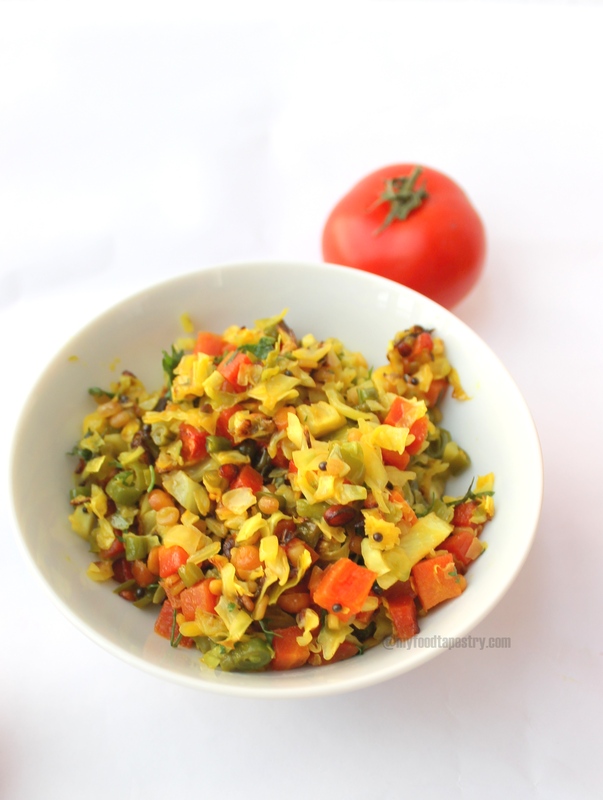 Throw in chopped tomatoes along with salt, turmeric and red chili powder. 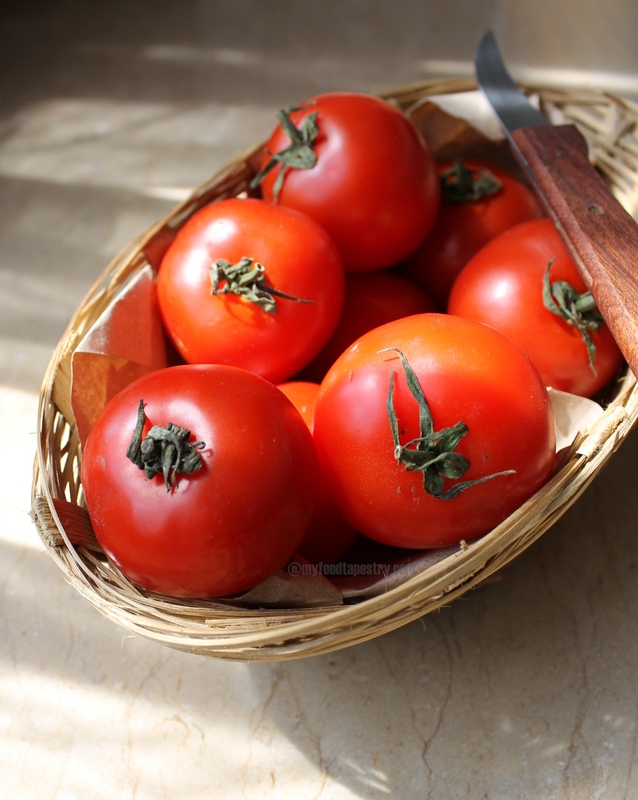 cover and cook till the tomatoes become mushy and fat leaves the sides. Approx 10 minutes. Once that is done, add 1 glassful of water. Give it a boil. Grate garlic and sprinkle pepper powder – give it another boil. Switch the flame off, mix in juice of 1/2 a lime and garnish with coriander leaves. Note: Quantity of water can be increased or decreased according to the consistency you prefer. I like mine thin and runny, so I usually add more than a glassful. Note: Tamarind, boiled lentils, rasam powder are all variations. You can try different types by adding these accordingly. Note: For those who do not like to use onion and garlic, you can skip both, and flavour the soup with a bit of asofoetida or hing. Its been one amazing year for Angie and her wonderful co hosts who throw this weekly visual potluck parties. So we are all celebrating! Thanks to the growing popularity and contribution to the event, the celebrations are extended for a two week program. Though I was unable to contribute to the last week’s appetiser and drink event, I make it up with another main course! So please run over to Angie’s First-Fiesta-Friday Anniversary and check out the various mouth watering link ups. Looks so inviting in this cold weather! Loved reading every bit of it and that rasam is slurrrrrp! Easy and so doable :). I just made a big pot last night, esp for the hubby, the sufferer of winter allergies. Your pot of rasam looks much better though! Love love the bright photos Namrata, esp the top shots!! And the photos are a bit bright aren’t they? You know how it is when you are shooting, editing and all… we actually miss the forest for the tree. But you must know how much I love those bright pics. I am partial to this style instead of dark and moody food photography, because you actually get to see what the food looks like! Thank you Loretta. Do try it once, maybe you could reduce the heat, but do try it. It makes for a wonderful winter drink! Can’t blame your daughter for demanding more of this yummy rasam! Excellent! Now, Now!!! Where do I start complimenting this post. Sensuous rasam? Poetic writing, or pictures as pretty as a postcard? Lets just say, a complete post. Milee was spot on when she demanded more rasam. Well done, Namrata!! Wow Elson, you write poetry yourself!! Thank you for appreciating the post so much. Firstly, I love the photos! They are so good and tempting me to lick the screen. I am shamelessly drooling like a baby! Secondly, the sugar craving…I love sugar and my daughter is at the other extreme… just like your situation. 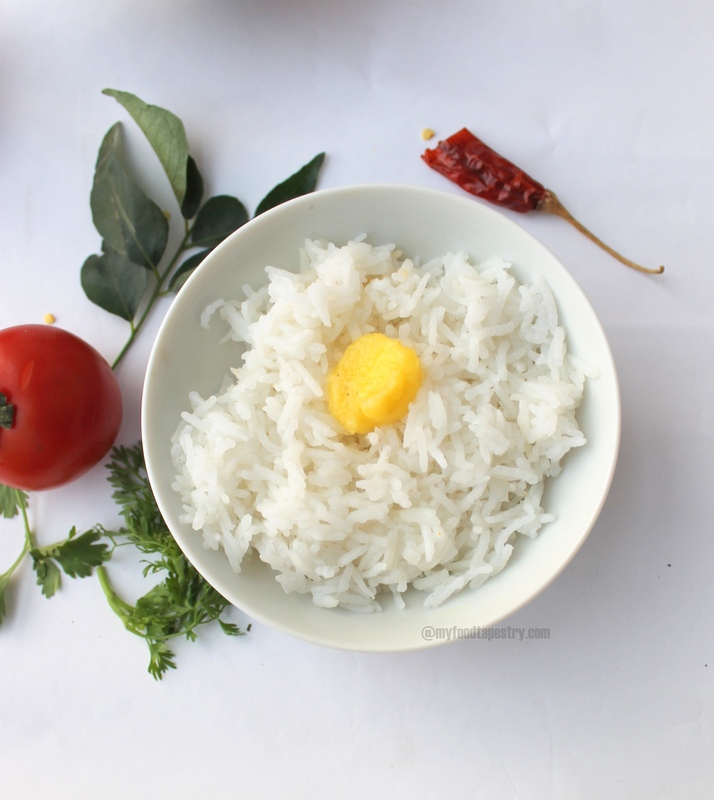 Finally, this rasam and rice combo is our favourite without a debate! Thank you Sridevi. I think its pretty enlightening to have kids who don’t share similar traits with ourselves. Never stops to amaze me. Such a beautiful post Namrata, love your writing and your photos are gorgeous! 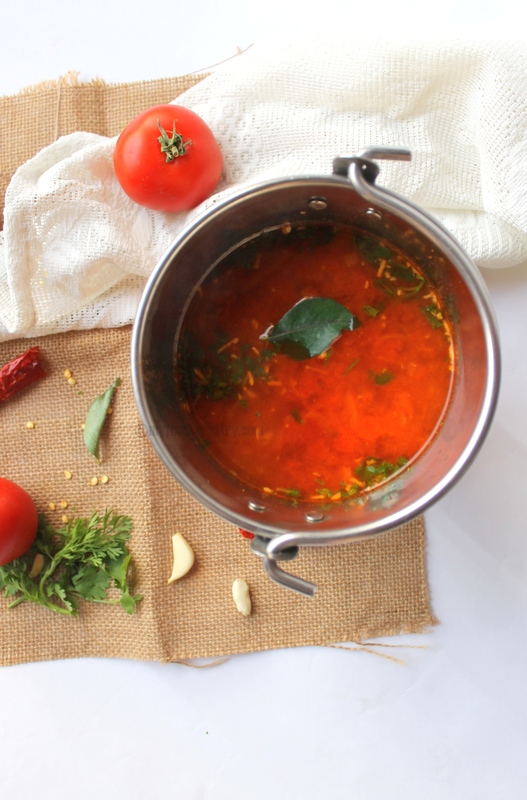 I would love to cuddle up in bed with a large bowl of this rasam! Yum!! Thank you dear. Your pictures are so delicious n lucid that an encouraging comment from you on photography makes my day! Thank you Namrata 🙂 you are too sweet! Have you ever tried eating with fingers? It’s somehow so satisfying! And ghee, well if you have ever tried it, you know how wonderful it is! thank you for visiting my bog. 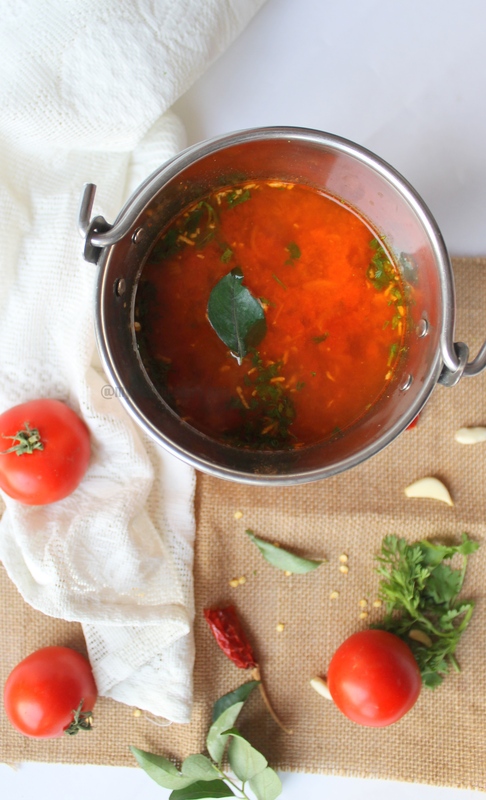 Do try this version of rasam and let me know how you like it. The vibrant colours and sharp flavour are outstanding. Bookmarked this one. Thanks for sharing. Yes, its a very winter recipe, isn’t it. Thank you for stopping by. Offf to see your blog now. Since my 10yr old daughter also likes tomato rasam very much, tried ur version today. Its really awesome! Thanks for sharing. ..
Oh wow, I am so glad you liked it. Its been my goto recipe for awhile now. I miss my rasam back home!!! 🙂 you are from Bangalore. I have a soft familiar corner for all Bangalorites…. it feels like home. Thanks Sadia, coming from you – I’m on cloud nine! the photos are awesome and the recipe so doable will definitely try it. Excellent quality of your recipe as well as the pictures.